The British Embassy in Albania is located in Tirana. The Embassy in Albania can issue visa, register births and register British nationals born abroad. 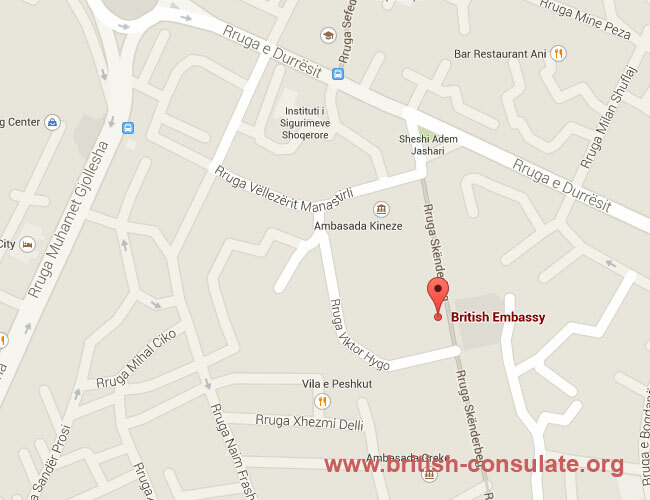 You can also obtain anew or temporary passport if you are a British national at the British Embassy in Tirana. Note the telephone numbers, location on the map and also their operating hours if you are going in person. There is also a page on Travel Advice for Albania for expats and holiday makers on this website. There is also a listing of all the Foreign Embassies in Albania on this website. Also note that the times for the Embassy change during summer and winter and that there is no public parking next to the embassy. Like every embassy around the world the British embassy in Albania is closed on Albanian holidays and major British holidays. The embassy is also closed on the national day of Albania being the 28th November. The remainder of the holidays are listed below for the embassy. Note that these are the Albanian public holidays only and that the Embassy is also closed on British holidays such as Easter Friday, Easter Monday and over the Christmas period in December. Due to new rule recently introduced by the Albanian government, non-biometric Albanian passports are no longer accepted for travel outside Albania. Speak to the embassy staff for more information about this development. We have listed the processing times for visas below at the Albanian Embassy. These are the average times for visa processing in Albania for a British visa. Check and ensure that all your documents are correct so that there is no delays in the visa process. Call the embassy to ensure that you have all that is needed for your British visa. Email them is much better than a telephone call.